Velayat-e faqih (Persian: ولایت فقیه‎, velāyat-e faqīh), also known as Islamic Government (Persian: حکومت اسلامی‎, Hokumat-i Eslami), is a book by the Iranian Muslim cleric, faqīh, and revolutionary Ayatollah Ruhollah Khomeini, first published in 1970, and probably the most influential document written in modern times in support of theocratic rule. The book argues that government should be run in accordance with traditional Islamic law (sharia), and for this to happen a leading Islamic jurist (faqih) must provide political "guardianship" (wilayat or velayat) over the people and nation. A modified form of this doctrine was incorporated into the 1979 Constitution of Islamic Republic of Iran following the Iranian Revolution, with the doctrine's author, Ayatollah Khomeini, as the first faqih "guardian" or Supreme Leader of Iran. 2.2 What is Islamic Government? 2.3 Why has Islamic Government not been established? While in exile in Iraq in the holy city of Najaf, Khomeini gave a series of 19 lectures to a group of his students from January 21 to February 8, 1970 on Islamic Government. Notes of the lectures were soon made into a book that appeared under three different titles: The Islamic Government, Authority of the Jurist, and A Letter from Imam Musavi Kashef al-Qita (to deceive Iranian censors). The small book (fewer than 150 pages) was smuggled into Iran and "widely distributed" to Khomeini supporters before the revolution. Controversy surrounds how much of the book's success came from its religiosity, and how much from the political skill and power of its author, who is generally considered to have been the "undisputed" leader of the Iranian Revolution. Many observers of the revolution maintain that while the book was distributed to Khomeini's core supporters in Iran, Khomeini and his aides were careful not to publicize the book or the idea of wilayat al-faqih to outsiders, knowing that groups crucial to the revolution's success—secular and Islamic Modernist Iranians—were likely to be irreconcilably opposed to theocracy. It was only when Khomeini's core supporters had consolidated their hold on power that wilayat al-faqih was made known to the general public and written into the country's new Islamic constitution. The book has been translated into several languages including French, Arabic, Turkish and Urdu. The English translation most commonly found, considered by at least one source (Hamid Dabashi) to be the "only reliable" translation", and approved by the Iranian government is that of Hamid Algar, an English-born convert to Islam, scholar of Iran and the Middle East, and supporter of Khomeini and the Islamic Revolution. It can be found in Algar's book Islam and Revolution, in a stand-alone edition published in Iran by the "Institute for Compilation and Publication of Imam Khomeini's Works", which was also published by Alhoda UK, and is available online. Khomeini further believed that Islamic government was, in its operation, superior to non-Islamic government in many ways. Additionally, though Islamic government is to be universal, Khomeini sometimes compares it to (allegedly) un-Islamic governments in general throughout the Muslim world and more often contrasts it specifically with the Shah's government in Iran—though he doesn't mention the Shah by name. In regard to non-Islamic governments, the work states "Non-islamic government..."
While some might think the complexity of the modern world would move Muslims to learn from countries that have modernized ahead of them, and even borrow laws from them, this is not only un-Islamic but also entirely unnecessary. The laws of God (Shariah), cover "all human affairs ... There is not a single topic in human life for which Islam has not provided instruction and established a norm." (p. 29-30, also p. 44) As a result, Islamic government will be much easier than some might think. In addition to the functional reasons above offered for guardianship of the jurist, Khomeini also gives much space to doctrinal ones that he argues establish proof that the rule of jurists is required by Islam. No sacred texts of Shia Islam specifically state that jurists should rule Muslims. Traditionally Shia Islam follows a crucial hadith where the Prophet Muhammad passes on his power to command Muslims to his cousin Ali ibn Abi Talib, the first of twelve "Imams" descended in a line that stopped with the occultation of the last Imam, Muhammad al-Mahdi, in 939 and who is not expected back until end times, (see: Muhammad al-Mahdi#Birth and early life according to Twelver Shi'a). Shia jurists have tended to stick to one of three approaches to the state: cooperated with it, try to influence policies by becoming active in politics, or most commonly, remaining aloof from it. Khomeini reasons that the term judges must refer to trained jurists (fuqaha) as they are "by definition learned in matters pertaining to the function of judge" (p. 84), and since trained jurists are neither sinful wretches nor prophets, by process of elimination "we deduce from the tradition quoted above that the fuqaha are the legatees." (p. 84) He explains legatees of the prophet have the same power to command Muslims as the Prophet Muhammad and (in Shia Muslim belief) the Imams. Thus, the saying, `The seat you are occupying is filled by someone who is a prophet, the legatee of a prophet, or else a sinful wretch,` demonstrates that Islamic jurists have the power to rule Muslims. The level of importance accorded rule of jurists and obedience to them by Khomeini in Waliyat al-faqih is as high as any religious duty a Muslim has. "Our obeying holders of authority" like jurists "is actually an expression of obedience to God." (p. 91) Preserving Islam "is more necessary even than prayer and fasting" (p. 75) and without Islamic government Islam cannot be preserved. The basis of Islamic government is exclusive adherence to Sharia, or Islamic law. Those holding government posts should have knowledge of Sharia (Islamic jurists are such people), and the country's ruler should be a faqih[Note 3] who "surpasses all others in knowledge" of Islamic law and justice (p. 59) -- known as a marja`—as well as having intelligence and administrative ability. Islamic Government will be just but it will also be unsparing with "troublesome" groups that cause "corruption in Muslim society," and damage "Islam and the Islamic state." In this regard it will follow the example of the Prophet Muhammad who eliminated the tribe heads of Bani Qurayza, (p. 89) after their murderous treachery. Why has Islamic Government not been established? This imperialist attack on Islam is not some ad hoc tactic to assist the imperial pursuit of power or profit, but an elaborate, 300-year-long plan. The British imperialists penetrated the countries of the East more than 300 years ago. Being knowledgeable about all aspects of these countries, they drew up elaborate plans for assuming control of them. (p.139, also p.27-28, p.34, p.38). Khomeini himself claims Mirza Hasan Shirazi, Mirza Muhammad Taqi Shriazi, Kashif al-Ghita, (p. 124) as clerics preceding him who made what were "in effect" (p. 124) government rulings, thus establishing de facto Islamic Government by Islamic jurists. Some credit "earlier notions of political and juridical authority" in Iran's Safavid period. Khomeini is said to have cited nineteenth-century Shi'i jurist Mulla Ahmad Naraqi (d.1829) and Shaikh Muhammad Hussain Na'ini (d.1936) as authorities who held a similar view to himself on the political role of the ulama. An older influence is Abu Nasr Al-Farabi, and his book, The Principles of the People of the Virtuous City, (al-madina[t] al-fadila,[Note 5] which has been called "a Muslim version of Plato's Republic"). Other observers credit the "Islamic Left," specifically Ali Shariati, as the origin of important concepts of Khomeini's Waliyat al-faqih, particularly abolition of monarchy and the idea that an "economic order" has divided the people "into two groups: oppressors and oppressed." (p. 49)  The Confederation of Iranian Students in Exile and the famous pamphlet Gharbzadegi by the ex-Tudeh writer Jalal Al-e-Ahmad are also thought to have influence Khomeini. This is in spite of the fact that Khomeini loathed Marxism in general, and is said to have had misgivings about un-Islamic sources of some of Shariati's ideas. Khomeini claims that governments based on constitutions, divided into three branches, and containing planning agencies, also belie a strict adherence to precedents set by the rule of the Prophet Muhammad and Imam Ali ibn Abi Talib, 1400 years ago. Scholar Vali Nasr believes the ideal of an Islamic government ruled by the ulama "relied heavily" on Greek philosopher Plato's book The Republic, and its vision of "a specially educated `guardian` class led by a `philosopher-king`". Velayat-e Faqih has been praised[by whom?] as a "masterful construction of a relentless argument, supported by the most sacred canonical sources of Shi'i Islam ..."
The authority of faqih — is limited to the guardianship of widows and orphans — could not be extended by human beings to the political sphere. In the absence of the Hidden Imam (the 12th and last Shi'a Imam), the authority of jurisprudence was not the preserve of one or a few fuqaha. A Bahá'í scholar of Shia Islam, Moojan Momen, has commented that Khomeini cites two earlier clerical authorities — Mulla Ahmad Naraqi (d.1829) and Shaikh Muhammad Hussain Na'ini (d.1936) — as holding similar view to himself on the importance of the ulama holding political power, but neither made "it the central theme of their political theory as Khomeini does," although they may have hinted "at this in their writings." Momen also argues that the Hadith Khomeini quotes in support of his concept of velayat-e faqih, either have "a potential ambiguity which makes the meaning controversial," or are considered `weak` (Da'if) by virtue of their chain of transmitters. When a campaign started to install velayat-e faqih in the new Iranian revolution, critics complained that Khomeini had gone back on his word to advise, rather than rule the country. This has sparked controversy. Despite having initially supported the Revolution, the late Grand Ayatollah Mohammad Hussein Fadlallah criticized what he saw as the Iranian clergy ruling with absolute power. Rather he wanted a system of checks and balances that would prevent the scholars from becoming dictators. In a 2009 interview, Grand Ayatollah Mohammad Hussein Fadlallah of Lebanon (a supporter of the Iranian Revolution, "widely seen as the `godfather`" of the Iranian-backed Hezbollah, and one of only three Shia Maraji of Lebanon before he died in 2010), stated "without hesitation"
I don't believe that Welayat al-Faqih has any role in Lebanon. Perhaps some Lebanese commit themselves to the policy of the Guardian Jurist, as some of them commit themselves to the policy of the Vatican [Lebanon's large Maronite community is Catholic]. My opinion is that I don't see the Guardianship of the Jurist as the definitive Islamic regime. Islamic Government is criticised on utilitarian grounds by those who argue that Islamic government as established in Iran by Khomeini has simply not done what Khomeini said Islamic government by jurists would do. The goals of ending poverty, corruption, national debt, or compelling un-Islamic government to capitulate before the Islamic government's armies, have not been met. But even more modest and basic goals like downsizing the government bureaucracy, using only senior religious jurists or [marja]s for the post of faqih guardian/Supreme Leader,[Note 8] or implementing sharia law and protecting it from innovation, have not succeeded. While Khomeini promised, "The entire system of government and administration, together with the necessary laws, lies ready for you.... Islam has established them all," (p. 137) once in power Islamists found many frustrations in their attempts to implement the sharia, complaining that there were "many questions, laws and operational regulations ... that received no mention in the shari'a." [Note 9] Disputes within the Islamic Government compelled Khomeini himself to proclaim in January 1988 that the interests of the Islamic state outranked "all secondary ordinances" of Islam, even "prayer, fasting, and pilgrimage." The severe loss of prestige for the fuqaha (Islamic jurists) as a result of dissatisfaction with the application of clerical rule in Iran has been noted by many. "In the early 1980s, clerics were generally treated with elaborate courtesy. Nowadays, clerics are sometimes insulted by schoolchildren and taxi drivers and they quite often put on normal clothes when venturing outside Qom." According to biographer Baqer Moin, "The change was immense. [Khomeini's] theory of Islamic government was based on the principle that the right to rule is the exclusive right of the faqih, the expert on Islamic law." ^ Khomeini, Ayatullah Sayyid Imam Ruhallah Musawi, Islamic Government: Governance of the Jurist, Institute for Compilation and Publication of Imam Khomeini's Works, n.d.
^ Khomeini (2002). Islamic Government: Governance of the Jurist. Alhoda. Retrieved 30 December 2016. ^ Dabashi, Hamid, `Early propagation of Wiliyat-i Faqih and Mullah Ahmad Naraqi` in Nasr, Dabashi and Nasr (eds), Expectations of the Millennium, 1989, pp.287-300. ^ Kadri, Sadakat (2012). Heaven on Earth: A Journey Through Shari'a Law from the Deserts of Ancient Arabia ... macmillan. p. 95. ISBN 9780099523277. ^ a b The Columbia World Dictionary of Islamism, ed by Roy Olivier and Antoine Sfeir, 2007, 144-5. ^ Brumberg, Reinventing Khomeini, (2001) p.? ^ a b "Fadlallah's Death Leaves a Vacuum in the Islamic World". Middle East Online. Retrieved 2011-02-03. ^ Pollock, Robert L. (March 14, 2009). "A Dialogue with Lebanon's Ayatollah". Wall Street Journal. Retrieved 4 November 2015. ^ "Mixed legacy of Ayatollah Fadlallah". BBC News. 4 July 2010. Retrieved 4 November 2015. 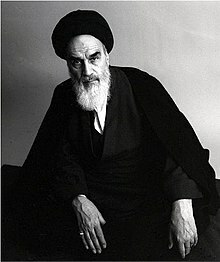 While he [Fadlallah] backed the Iranian revolution, he did not support the Iranian invention of the concept of Wilayet al-Faqih, which gives unchallengeable authority in temporal matters to the Supreme Leader, currently Ayatollah Ali Khamenei, who was only a mid-ranking cleric when he attained the leadership. Abrahamian, Ervand (1993). Khomeinism: Essays on the Islamic Republic. California: University of California Press. ISBN 0520081730. Retrieved 30 December 2016. Arjomand, Said Amir (1988). Turban for the Crown : The Islamic Revolution in Iran. Oxford University Press. Dabashi, Hamid (2006). Theology of Discontent : The Ideological Foundations of the Islamic Revolution in Iran. New York University Press. Demichelis, Marco, "Governance", in Muhammad in History, Thought, and Culture: An Encyclopedia of the Prophet of God (2 vols. ), Edited by C. Fitzpatrick and A. Walker, Santa Barbara, ABC-CLIO, 2014, Vol I, pp. 226–229. Khomeini, Ruhollah (1979). Islamic Government. translator Joint Publications Research Service. Manor Books. Retrieved 30 December 2016. Khomeini, Ruhollah (1981). Algar, Hamid (translator and editor), ed. Islam and Revolution : Writing and Declarations of Imam Khomeini. Berkeley: Mizan Press. Moin, Baqer (1999). Khomeini: Life of the Ayatollah. New York: Thomas Dunne Books. Momen, Moojan (1985). An Introduction to Shi'i Islam. New Haven and London: Yale University Press. Roy, Olivier (1994). The Failure of Political Islam. Carol Volk (trans.). Cambridge, Mass: Harvard University Press. Schirazi, Asghar (1997). The Constitution of Iran : politics and the state in the Islamic Republic. New York: I.B. Tauris, 1997.